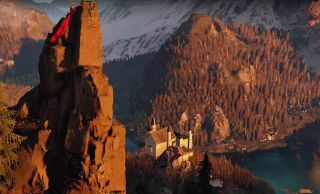 Crytek has released a new gameplay trailer for its VR mountain climbing sim The Climb, this one showcasing the game's second location in the Alps. The new teaser shows off more in the way of gameplay than the announcement trailer posted late last year. The disembodied hands appear to have changed ever-so-slightly, and those route guides painted onto the rock are interesting too, and not something I recall seeing prior to this teaser. Routes—although not route makers—are something that Senior Level Designer Matthias Otto actually talked about in a blog post last month. He said Crytek designed the game with plenty of horizontal and even downward movement, in order to avoid discomfort and neck strain caused by climbing—and thus looking—upward all the time. He also said the team opted to incorporate a fade-out when players fall, because the sensation of falling is a rush, but the sensation of landing apparently proved to be a little less pleasant. James spent some time with The Climb back in December and described it as "a harrowing bit of fun," which sounds promising, although he also copped to a dreadful fear of heights, which no doubt contributed to the intensity of the experience. It's being developed for the Oculus Rift, and while there's currently no launch date, there is a website at theclimbgame.com.